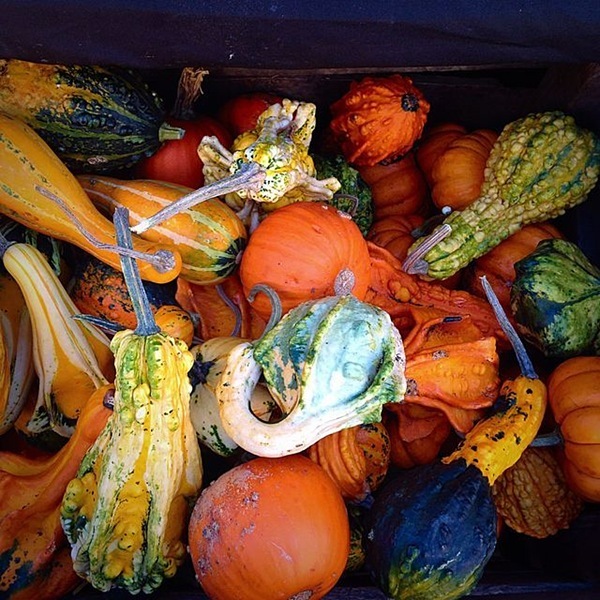 Squash are the ultimate sign of autumn and the approaching holiday season. Not only do edible squash grace the markets and our dinner tables, but gourds and pumpkins also take up residency on our doorsteps—welcoming us home, inviting in family and visitors, and telling of the warmth, coziness and cheer that await inside. Not much feels more like fall than sitting down to a meal with roast squash—the smells that fill the house from its time in the oven, and the sweet creaminess of its warm flesh. Squash is a fruit, after all (the internal seeds give it away). But besides pumpkin pie, squash is typically used in savory dishes. And with Thanksgiving fast approaching (mental note: now is the time to order your heritage bird! ), squash recipes are abound, begging to be cooked. While the upcoming holiday is often focused on the recipes and eating a delicious meal (don’t get us wrong, we Foodstanders love our food), it’s truly about being thankful and appreciative for everything that we have—loved ones and food alike. An amazing way to celebrate the people we love is cooking an amazing meal for them. And the best way to celebrate the beautiful food on our plates? Join Foodstand in pledging a #NoFoodWaste November, by being mindful of the ways in which we can get the most out of our food. How? Click to tweet your #NoFoodWaste pledge. Then share your good no-food-waste deeds on the Foodstand app and apply #NoFoodWaste. Yes, we have prizes for the top posts. But really, feeling good about using ingredients to their fullest potential is the best reward. #NoFoodWaste is good for the planet, ourselves, and our wallets! Less food waste, huh? Yes. Take squash for example. Instead of tossing the seeds, clean and roast them with sea salt like Foodstander @Tiffany for tomorrow’s snack. And all the peelings and squash guts (that’s the technical term) can be composted, returning the nutrients to the soil to help grow more squash. Using the whole thing is a great way to have #NoFoodWaste. And if you want more ideas, check out Foodstand’s #NoFoodWaste November Tips, our top 5 ways to help you cut food waste in the kitchen, to start you on your way. 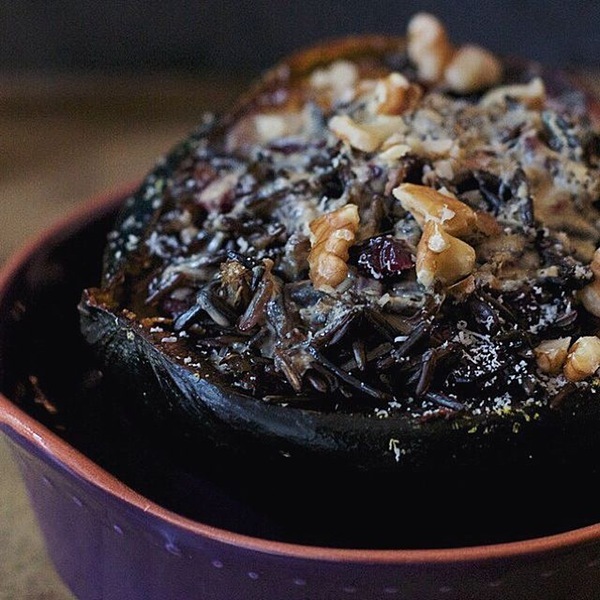 Pre-heat the oven at 400f degrees while you chop the acorn squash in half, lengthwise and remove the seeds from the centers. While the squash is roasting, cook your rice according to the package directions (should be 1/2 cup wild rice and 1 1/2 cups water, boil, then simmer covered for 30 mins). If you prefer to do white or brown rice, go for it! When squash is finished, flip over and set aside. When the rice is finished cooking, mix in the cranberries, and spoon mixture into the centers of the squash. Drizzle the tahini (3 tsp for each half) over the rice mixture and place in the oven for approx. 10 minutes. Roughly chop the walnuts and sprinkle over, as well as cheese if you’re using it. Serves 2. Preheat the oven to 350*. Whisk together the dry ingredients (oat flour, baking powder, salt, cinnamon, nutmeg, ground cloves and ground ginger) until mixed thoroughly. In a separate bowl, mix the wet ingredients (pureed pumpkin, apple cider, maple syrup and melted coconut oil). Add wet mixture to the dry mixture a little at a time and combine. If you have a mini doughnut pan, that works perfectly, if not, a regular cookie will work just fine! Either way, spray or oil your pan. Add your batter to a large freezer bag with a spatula. Twist the end like a pastry bag and squeeze the batter down towards the corner of the bag where you can snip off the tip. Using the bag, either fill the doughnut pan or create doughnut shapes on your cookie sheet by outlining small circles. Cook doughnuts for 10 minutes. In a clean bowl, mix cinnamon and sugar together to create a coating for the doughnuts. After 10 minutes, take the doughnuts out of the oven and allow to cool for 1-2 minutes before dunking each of the doughnuts in cinnamon and sugar and placing back in the pan. Cook for an additional 10 minutes with the coating. 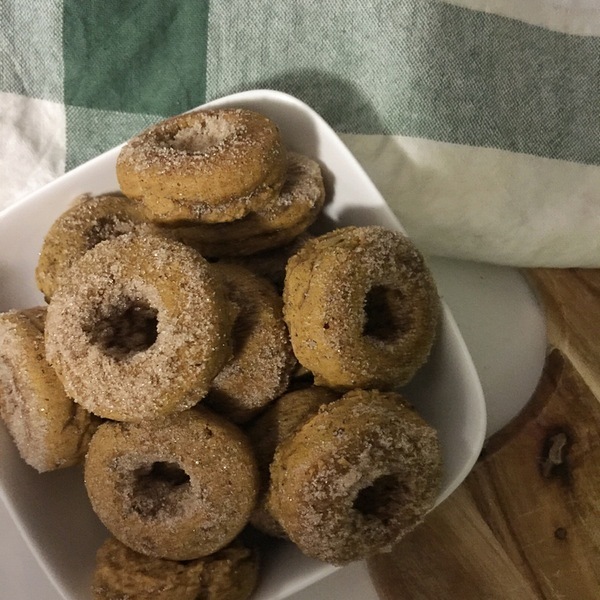 If you’d rather not add the sugar coating, cook doughnuts straight through for 15-20 minutes and lightly sprinkle cinnamon on top before serving. Makes about 22 doughnuts.